other products at Scrapping Cottage. that it is almost fall. and a feeling of excited anticipation for a welcome change. always ready for the next glorious season to arrive. fall release that will shortly be upon us! I just love the Under the Sea themed dies from the August Cottage Cutz Release! Plus, since July the Cottage Cutz dies have been released in pink and they are so pretty!! I almost didn't want to foam them when they arrived! For this layout, I used a couple of the great ocean shell shapes to accent the corner of my photo. These Cottage Cutz Dies are so well designed that by just adding a little simple shading, you can really make them come to life. I cut the large Palm Tree using my Silhouette. The title fonts are Rollerskate (which is on sale right now for 50% off!!!) and Central Park. The August Cottage Cutz release is really going fast! If you haven't ordered your favorites yet, you better not wait too much longer! Or while you are shopping for some of the spooktacular September Cottage Cutz, grab a couple of your favs from the July and August releases so you can get that Free Shipping and finish up some of your summer layouts at the same time! I have ONE more card idea for your CottageCutz Frog w/Crown die today. Scrapping Cottage. The CottageCutz dies are exclusive to Scrapping Cottage. Isn't this the cutest Woody Car you've ever seen? This was so fun to make and see it come to life as I put together the pieces of this Woody car. I chose my patterned paper and then some orange cardstock to match and started cutting. I also used my ink and daubers to shade the pieces before I put them together. When I was done I used some mounting tape to make the car pop up just a bit. 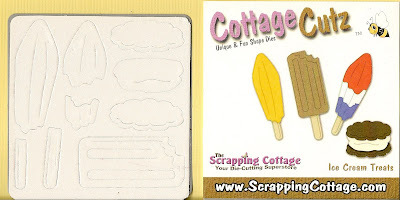 Check out all the fun CottageCutz dies available at The Scrapping Cottage. Don't forget to enter our contest for a $250 Shopping Spree - it's simple and you may be the lucky winner! Have you thought about using the CottageCutz Frog w/Crown die for making fun holiday cards? :) In part four and I suppose my last of the series (although I still have lots of ideas for this die), I did two cards. One is a Halloween card featuring "Count Frogula." :) The second card is Christmas themed. I hope you have enjoyed my "feeling froggy" series. Be sure to check out all the great products at Scrapping Cottage. New CottageCutz Halloween Release is now available for pre-order. Save 15% on individual items, Save over 20% on the bundle. Theme is spooky, scary and Trick-or-Treat with 21 new Halloween shapes. Shipping mid-September! loves all bundled up into one piece of 12 inch paper! found on the white star. It is perfect for this layout! are or make them be what I want them to be!! CottageCutz are the perfect dies for everything!! If you are like me, you don't get to see a lot of your friends during the summer. So, what a great opportunity to let you friends know you are thinking about them AND show off your card making skills by sending out some fun and bright summer hello cards! The Cottage Cutz Summer Shapes from the June Release are just perfect! These Popsicle shapes are just perfect for any summer related paper crafting project. 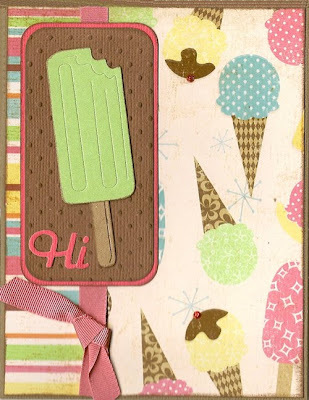 For this card, I used some pearlescent cardstock to give my Popsicle a shiny, icy look. I also embossed the brown cardstock and then took my brown chalk ink and rubbed it across the top of the cardstock. Because my embossed dots are raised, it is easy to cover them with ink without getting any on the background. This technique helps the embossed pattern to stand out a bit. I also used the Quickutz Rollerskate alpha for my sentiment. I love this alphabet because it is perfect when I need a smaller alpha but also has some style to it as well. This is a GREAT time to pick up this alpha because right now Rollerskate is 50% off!!! Add it to your cart while you are taking advantage of the last few days of the preview sale for the fabulous Halloween shapes from the September Cottage Cutz release! If you haven't seen this shapes yet, you are going to be blown away!! 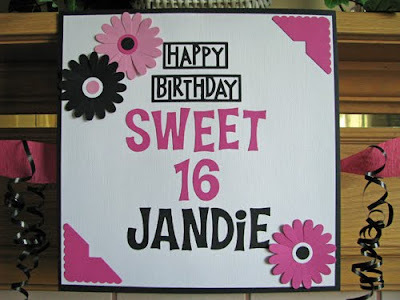 Today is my youngest daughters Sweet 16 Birthday. 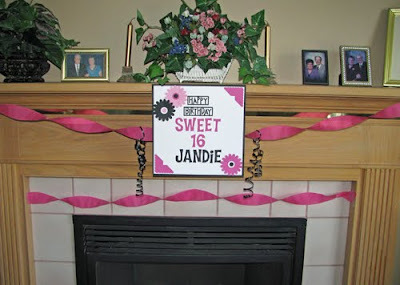 We always decorate a bit for the birthday boy or girl in our family with some crepe paper and a painted wood sign that says Happy Birthday. I wanted something a little more special since 16 is such a big birthday, after all you are old enough to get a real job, get a drivers license and in our home your finally old enough to date. I just took two sheets of 12x12 cardstock and made the base for my mini banner. Then I decided on the new Quickutz Teriyaki Cookie Cutter font for my message. Add a few other diecuts and colors and there you have it. This idea would be great for any celebration and costs very little and personalizes the occasion. I put this up on our fireplace mantle with some Sticky Tac so I can slip this into her scrapbook when I'm done with no tape marks to tear the cardstock. Here's two more ideas for the CottageCutz Frog w/Crown die. This die is so cute and I have such fun with him (as if you couldn't tell). 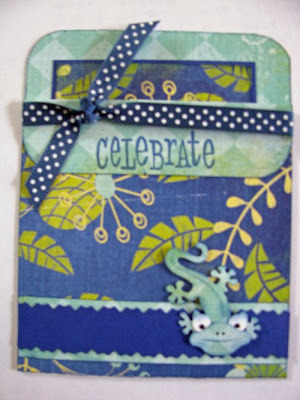 :) Be sure to check in next Monday for the last of my "Feeling Froggy" series of ideas. and there is nothing like a great daughter! it is so much fun scrapbooking pages of her! those "special" shoes stand out! Best dies on the planet! your today....before it is too late!! Watch for it Wednesday #22! technique and I wanted to pass it on to all of you!!! I first poured a little bleach onto a folded paper towel. I used the paper towel as if it were an ink pad and "inked"
get the excess bleach off of the stamp (so it wasn't too wet). After that, I stamped the image onto a piece of cardstock. choose to let it air dry. Stamp as few or as many times as you like. that you can embellish any way you like! So easy and so much fun! Do you get it??? 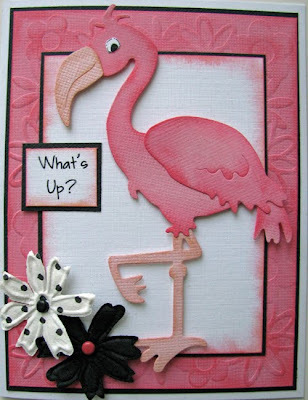 I thought this would be a fun saying for this CottageCutz flamingo card. This die is so fun! He goes together so quickly too! For this card I used the new Quickutz Flower Embossing folder, Lipstick Distress Ink and a couple of flowers I had on hand. I printed my saying on the computer and used some mounting tape to make my flamingo pop off the card a bit. I have a friend I need to send this card to, it's been way too long since we've talked. I'm lovin' these CottageCutz dies! one that was inspired by the Katy Perry song "I Kissed A Girl." 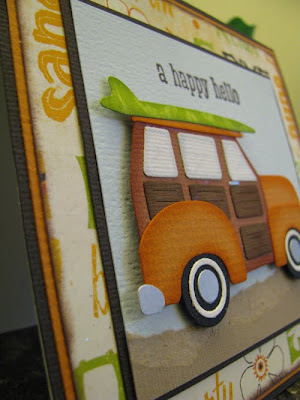 :) The second card is a quick and easy one that uses a green paint chip and the slogan "Go Green"
Be sure to check out all the great sales and products at Scrapping Cottage. 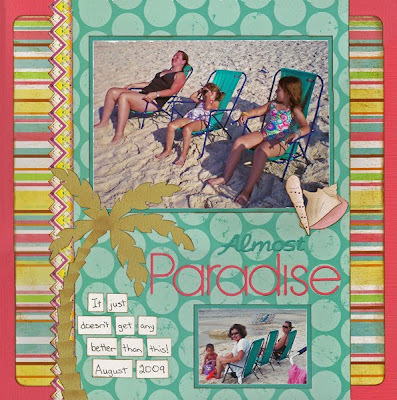 but I actually stockpile beach scrapbooking supplies! Everything from paper to popsicle sticks to dies! cutest, most unique beach dies on the planet! CottageCutz die helps me out. I get the "homemade"
look that I love and they do all of the work! 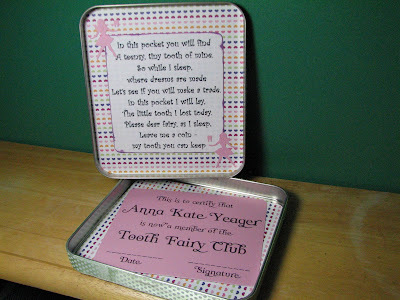 A scrapbooking friend of mine made a Tooth Fairy kit for her granddaughter and I thought it was such a fun idea that I wanted to make one for my oldest daughter, too. I used the tin that the old Silhouette Download Cards used to come in. Then I covered it with some papers from my stash. I used the QK Merry font and the retired QK toothfairy die. 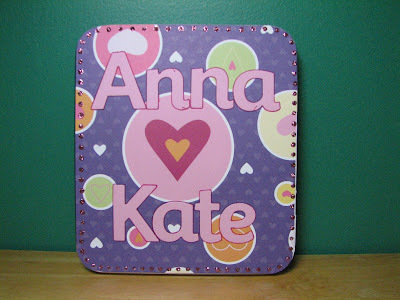 I added some stickles on the top for some extra bling which I knew my daughter would like. Then, when she lost her first tooth, this is what the tooth fairy left her along with a special toy for her first tooth. I have spent a great deal of time this summer cleaning out and organizing different parts of my home. Some areas were more "over-due" for this work than others. :) And of course, I couldn't neglect my scrap room! For today's tip, I have a couple of good storage solutions that I use to organize and store different sized metal dies. The first one is for your 12" long dies. I discovered this tip "accidentally" one day while shopping with my youngest daughter in Hobby Lobby. In an attempt to keep her happy while I finished up my shopping, I let her pick out one of these colored transparent boxes. As I was helping her pick out which one she wanted, I started kind of looking over them myself and then it dawned on me that these ruler boxes would make a PERFECT storage place for my 12" dies! I love it because it is pretty, very inexpensive, and completely functional! You can see from the pictures that each box will hold a lot of 12" dies. I love having all of my 12" dies together in one place. It makes it so easy to see everything I have if I am not sure what border I want to use. My second storage tip is for your 4x4 dies. Have you ever tried sliding one of your 4x4 dies into a CD sleeve inside a CD holder? It is the perfect size! The sleeves are wide enough to make getting the dies in and out very easy, but they still hold the dies securely in place. I have started using this particular CD case because I like how sturdy the outside case is which allows me to stack them on top of one another. (Yes, I have had to add a second CD storage box to hold all of my 4x4 dies. And after I get my hands on the Halloween Cottage Cutz dies, I am probably going to need to add a third!!) What is great about the CD holders for die storage is that there are so many different types and sizes available, you can easily find ones that meet all of your needs. 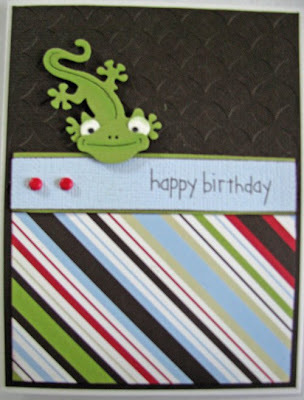 Today I'm featuring this cute 2x2 CottageCutz Gecko. This comes with two pink dies and he's so fun to play with. 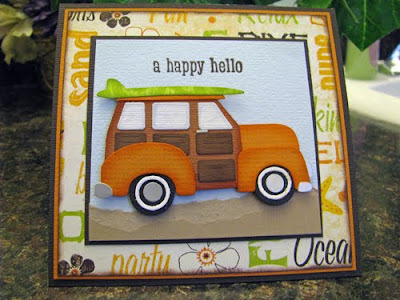 This pocket card would be perfect for that special friend or relative going on a tropical vacation or cruise. Just pull out the card inside and write your message and slip right back in. There's even room for a gift card. This birthday card will definitely get a big smile when it's pulled out of the envelope and is perfect for that teenage boy. This Gecko die is sure to please for many occassions. The CottageCutz dies are made in the US and cut wonderfully with your Quickutz Revolution, Epic, Cuttlebug or Sizzix brand machines. And I just love that they're pink!